You have probably read the Mackinac Center’s excellent works on Michigan’s government finances, much of which they release through Michigan Capitol Confidential. Top quality analyses, but parochial in the sense that they don’t place Michigan’s government finances in the context of the other American states. 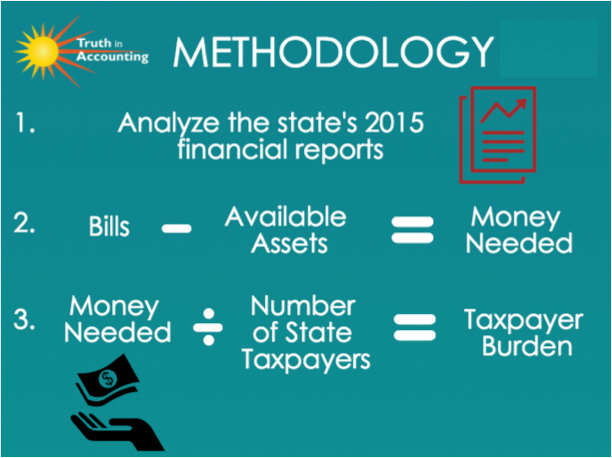 An Illinois 501(c)(3) organization, Institute for Truth in Accounting does, and has come up with a useful metric – taxpayer burden – by which you can rank Michigan financial status relative to the other states. No accounting degree necessary. Suffice it to say, you will not be reading any of Truth in Accounting’s work in Michigan’s nitwit, cheerleading media. The Institute for Truth in Accounting (352185292), released its report on the 2015 financial conditions of the states last month. Michigan placed 41st among the states with a net $ 18,200 taxpayer burden, the amount each Michigan taxpayer would have to pay the state’s treasury in order for the state to be genuinely debt free. The $ 18,200 2015 taxpayer burden of Michigan is $ 100 worse than 2014’s number, suggesting that the recent happy talk out of Lansing is whistling past a graveyard. 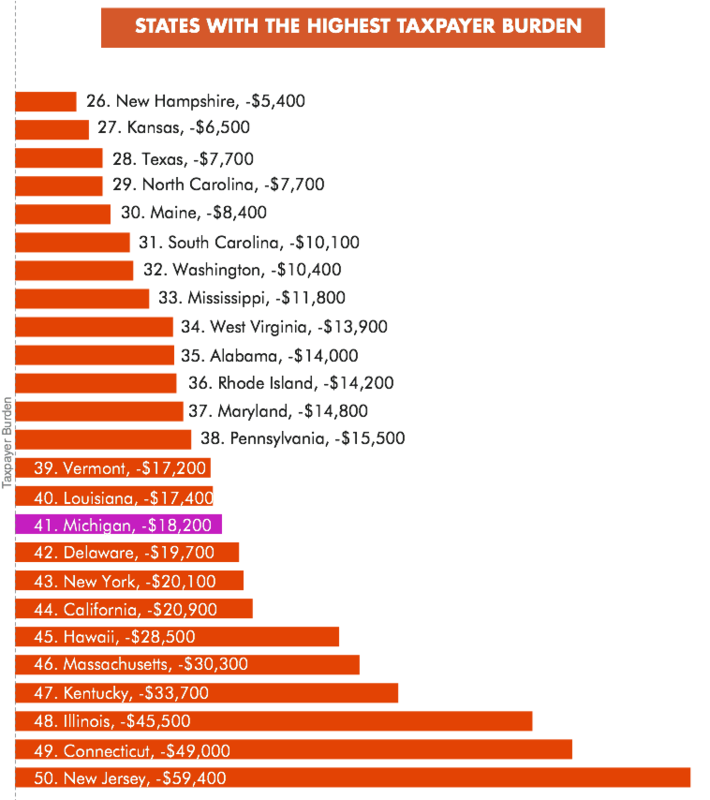 At best, Michigan is now treading water financially. The overarching issue in Michigan’s financial predicament is retiree benefits: pensions and retiree health benefits coverage (OPEBs). Mackinac Center correctly points out that Michigan and its local units of government have started to deal with these retiree benefits, but TIA’s report shows just how much these retiree benefits have damaged Michigan’s financial health. They didn’t have to, Michigan’s politicians could have made provisions for their promises, but they didn’t. Now the taxpayers of Michigan face a bleak future, made all the worse by Flint, the Detroit Public Schools, Medicaid Expansion, and all the other financial millstones recognized over the past year. Download the two page summary of Michigan’s financial position prepared by TIA. An easy read constructed from the numbers in the State of Michigan’s 2015 CAFR, along with the DTMB Office of Retirement Services 2015 CAFRs. TIA has cut through thousands of pages of accounting minutae to give you a good reference in only two pages. Snyder Administration partisans will take exception to TIA’s analyses because they assign a lot of school districts’ retirement liabilities to the State of Michigan. But Governor Snyder cannot have it both ways. His presumption that school district liabilities would befall the state was the horror story which stampeded legislators into approving the iniquitous PA 192 – 197 DPS bailout. You cannot shill the DPS bailout on one hand and then claim AG Opinion 4422 is controlling when it comes time to judge Michigan’s finances. The good news here is Michigan’s true financial position will probably not get much worse because new employees are generally not being enrolled in open ended, very expensive retiree benefits. The bad news here is that Michigan’s financial position will remain poor for quite some time into the future as ‘grandfathered’ employees collect on politician’s empty promises. You can forget about any future state tax cuts in Michigan, regardless of what happens to interest rates. The really ugly news here? While GASB Statement 67 and Statement 68 have dramatically improved the truthfulness of Michigan Comprehensive Annual Financial Reports, there is still a major deceit in most of them: the assumed rate of return on investments. Most Michigan CAFR’s presume that funds set aside to pay retiree pensions and benefits will grow at rates around 8%. When was the last time your bank accounts or IRAs grew at an 8% annual rate? Safe investments for pension funds simply cannot exceed the Treasury rate by this amount for any period of time. Treasury rates may go up a little as Janet Yellen takes her foot off the throat of the economy, but they won’t go up much. Certainly not enough to permit a safe 8% rate of return. The next economic downturn will probably not be as severe as 2008’s, but you can rest assured that it will put paid to the 8% lie. 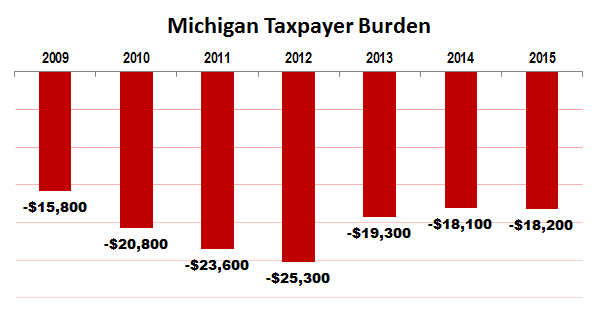 Michigan’s taxpayer burden will rocket up. Regardless, Truth in Accounting has provided Michigan taxpayers with a useful tool to judge the performance of Michigan’s politicians relative to other states’ politician’s. TIA also has reports for some of the major municipalities in Michigan, but they are a bit out of date. Given Michigan’s recent history, we really need current, comparable reports on Michigan’s counties, school districts, and municipalities. Soooo...what about pension obligation bonds due by 2018? Weren't POBs just manipulated b the legislature (with not word one said by anybody) to include 'health care' as well? Why are wealthy people suddenly willing to not only partially fund pensions...but (now) 'health care' as well with (cough) "no strings attached"? Were pensioners just that bad at "math"...or is the complete silence surrounding POBs/generational thievery (now) indicative of a whole state full of people REALLY good at math not to mention feigning ignorance? I would also respectfully have to argue (10x25) your "excellent" and 'top quality" descriptions of the Mackinaw Center's reporting involving these issues in particular. Years ago, I attended a Tea Party gathering where the featured speaker was brought in from MCCP to discuss one of the state proposals. After (repeatedly) being forced to explain that those attending actually needed to 'understand' the proposal wording (in detail) vs "you just tell us how to vote" ; I asked one pretty simple question surrounding pension obligation bonds and why the MCPP had 'flip flopped' on their utter disdain for them ('period' for many years). When "no vote of the people required" Michigan Senate Bill 1129 of 2012 was (finally) winging its way through the legislature? The MCPP became just as quiet as TeaPartiers did. That intentional silence became even more deafening when 'health care' (an issue that they had 'also' long railed against) was suddenly 'no big deal' added to upcoming bloated/corrupt POB legislation while the wealthy became even larger (now inextricable) power brokers in state and local government. While the MCPP has done some great work, as has the Tea Party, it is NOW that our children need them. Yet when the time has come to put those children and their future in perspective via the concept of shared sacrifice and just plain legacy bound fiscal responsibility? The lack of willingness even right here to head on tackle these issues (for years) has been (and will be) the true measurement of both movements and men in our final judgement days. 10x25MM thank you, thank you, thank you. This debt was not quietly amassed and the eventual outcome was discussed early on--in fact back in the 70's, then again with passing of prop A. There were all these bait and switch schemes and always was in awe in how they were marketed to the people. The only way out in Snyder's mind's eye is to take in as many refugees as possible. Each unvetted refugee brings huge tax-free federal funds for housing, food, medical, etc.,as well as depletion of Social Security/Medicare and being given the right to vote. In fact, Michigan will receive the most refugees of any of the 50 states (Or is it 52?--the pres. said this so it must be) while other states are invoking the 10th Amendment, stating unequivocally, NO! Snyder's been giving away the store and is apparently the only one in the state with open arms. When questioned, he has stated it's the feds and we have no say. What, is he nuts? By 2017, if not already, 17,000 Syrian refugees, with only 3% of Christian faith, will land in Michigan (the most of any state). With each comes, I estimate $100K plus in benefits from not only the Feds but the U.N. (All our money) This amount includes the private social agencies' fees and overseas funding by the Saudi's, the building contractors converting hotels to apartments, etc. Simple math reveals 17K x $100K= $1,700,000,000.00. Hardly enough to pay down a debt or endanger our way of life. Make no mistake--none of this is an accident. Please wake up, vote to make America Great (again). Ps. Sue, you spelled rapefugees wrong. No, I don't give a flying one if they're moonslime or, christian - they gotta go back. weeks he is looking for work. man, put it in another's chest and in 2 weeks he is looking for work." him President. Now, the whole damn country is looking for work!"